Madison Ave in Albany sometime during the 1940s. Courtesy of The College of Saint Rose Archives. There's something about trolleys that lights people up -- even though a lot of people weren't even alive the last time a trolley rolled through Albany. It's been almost 70 years since the lines stopped. We were thinking about trolleys again this week after seeing this photo from the College of St. Rose Archives. 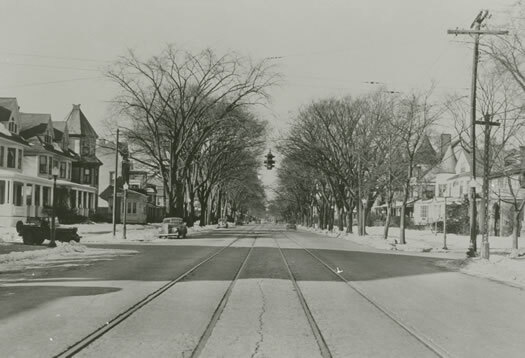 It's Madison Ave at Partridge, facing west, sometime in the 1940s, right about the time the trolleys stopped. We love the way the tracks lead away covered by the canopy of trees. That photo prompted us to dig through some of the history of trolleys in Albany -- which is like looking through some alternate transit universe. 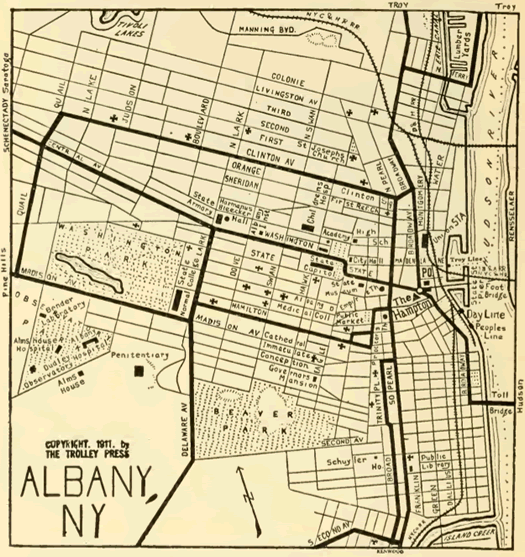 For a while, the trolleys were a main part of the city of Albany's transportation system. The trolleys and tracks are easy to spot in this postcard and photo from the area around what is now the SUNY administration building. The trolley cars themselves were rather handsome from the outside. Get a seat? Oh, what a joke! Why, a strap can't even be seen. "Move up in front! There's lots of room!" Then one grand dash for the bus. But,--who'd want to change places with us? After a run of about 80 years, the trolleys were overtaken by buses and cars. They were discontinued in 1946. You can see still evidence of the trolley system if you know where to look. There's an old trolley pole on Hamilton Ave in Albany. And that old building that seems totally out of place in Colonie at 1830 Central Ave is a former power station for the Schenectady Railway. And every now and then old tracks are found while digging for some other project. + Gino DiCarlo's collection of Capital District trolley info is well worth a look. In fact, if the stuff above was at all interesting -- you gotta check out his site. He has a bunch of old photos. + And here's a short documentary about Albany's trolley system by a group of UAlbany students. Great piece. My parents both grew up in the "Tri-Cities" (a moniker widely used before "Capital Region" became the go-to term, a function of suburban sprawl?) in the 1930s and 1940s and fondly recall the excitement of riding the trolleys when they were small. And just yesterday I noted the visible tracks on lower Hamilton Street in Albany, between Phillip and Grand Streets. I wish more residential side streets retained trolley tracks as a hat tip to the city's history. Much more effective and less annoying than the historic cobblestone intersections throughout parts of town. What I wouldn't give to have those trolleys back. People love nostalgia and I believe a trolley system would definitely generate economic activity. Just Imagine one of those trolley lines running from the D & H Railroad Building up State and connecting to uptown. Could anyone really argue that would be a bad thing? I remember the last trolley to go was the So. Pearl line that ran to Kenwood. we lived on Broad St. on the third floor and the house would rattle when the trolley went by. It ran every 20 minutes.We would transfer at State and Pearl to other lines. It was noisy but convenient. This is a great piece. That poem -- what a find! I've been meaning to travel these routes and see how many of the listed landmarks are still there. Excellent! Damn, now I've gotta go digging through Fordham's archives, too? 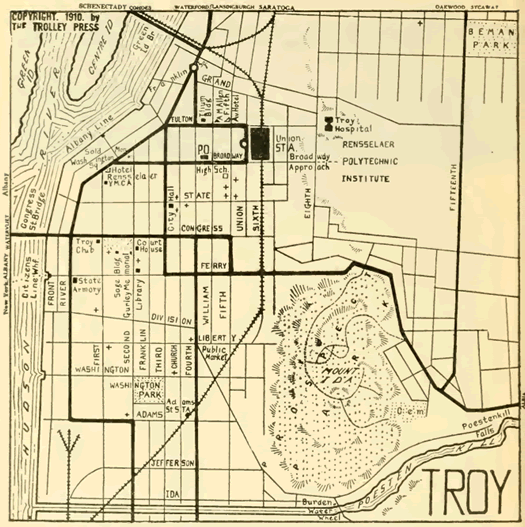 One of the early inducements to buying a home in Pine Hills was that it was a quick streetcar ride from downtown . . . a businessman could go home for lunch (after all, the wife was there to prepare it) and get back downtown in just minutes. Faster, I'll wager, than it can be done today by car. As long as they're restructuring Madison is there any reason we can't lobby to bring back the trolly? This is SO cool. Not sure if its true but I heard they destroyed all the old cars for scrap where the VA is now on Holland. Amazing how short-sighted people are sometime. They though "why would any future generations want to see these cars? Let's destroy them for a couple bucks." Mayor Jennings says the same thing today about all the 18th and 19th century buildings he's demolished for important things like....parking lots. Bringing back trolleys even just say Broadway up State to Washington to Colvin would be the same as asking our politicians to build a couple pyramids. It ain't gonna happen. Only way that happens if private citizens organize it and get corporate sponsors. Then it has a chance. Imagine getting on one at Colvin or Quail to Lark for a couple pops then down to Wolff's. Fascinating piece-especially for someone who did not grow up in the Capital Region/Tri-Cities. I love learning about the history. In enjoying the links embedded in the article, I lost the original AOA post. I used to dabble in web editing myself, but don't know what today's web etiquette says about links. Would AOA consider making links open a new browser window instead of usurping the AOA page? Or is that considered a no-no in today's web world? 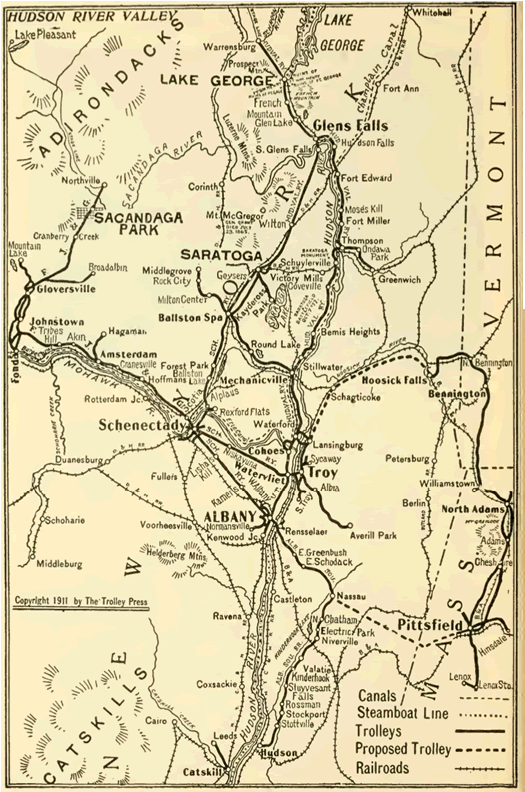 My grandmother grew up in Schenectady during the 1920s & 30s. They regularly took the trolley to Albany and never needed to own a car. Wouldn't that be nice? @MB I usually just hold "ctrl" and then click the link and it'll automatically open in a new tab. Then you can go back to the original post. There is a portion of the novel Ragtime that makes up in its entirety a trip by trolley from New York City to Boston. Whenever you bring up the possibility of light rail in the capital region, the objection is raised that we don't have the population density and size to support it. 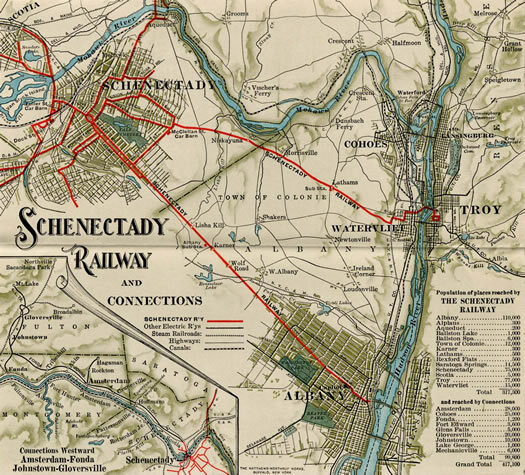 The history of trolley lines in Albany, Schenectady, and Troy casts some doubt on that claim. Toronto is one of the few North American cities that retained their trolley lines, and updated them for the modern era. Today the 504 King street line alone books 72, 000 trips per day. Electric trolleys (or streetcars and they're called in Toronto) are a lovely way to travel.